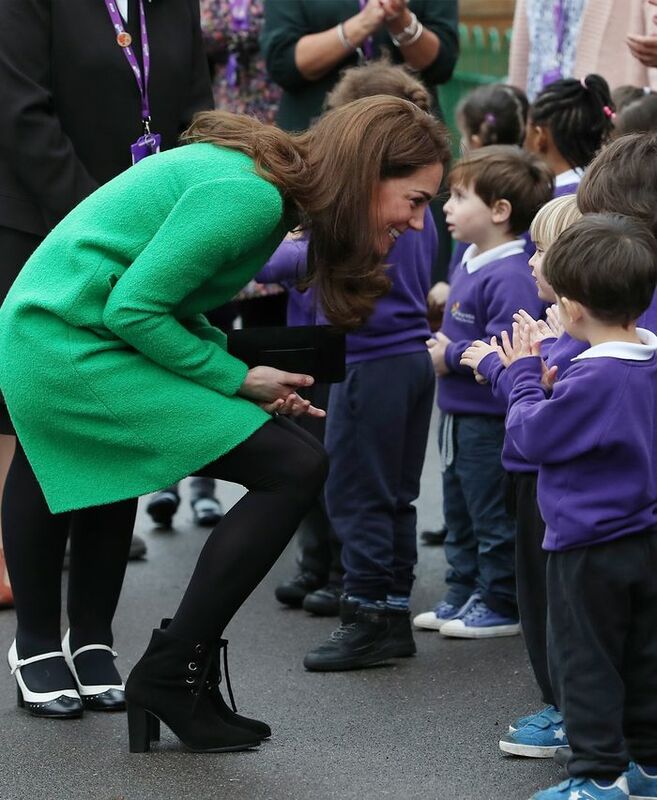 Today the Duchess of Cambridge visited Lavender Primary School for children's mental health week, taking part in a number of activities with the children to identify the things that make them feel good. Kate wore a bold green dress by a label that she has been wearing since 2016, Kensington-based bespoke dress brand Eponine London. Her choice of shoes, however, was less predictable, as Kate wore a pair of lace-up black suede ankle boots with a chunky heel and gold eyelets. It's a more casual choice of footwear for the Duchess, who usually favours a conservative court shoe or something a little more formal. This might be a more relaxed style of ankle boot for Kate, however, they are from one of her trusted high-street shoe departments—L.K.Bennett. It can be tricky to wear dresses in winter, however, this black opaques and heeled suede ankle boots pairing instantly makes any mini or midi dress appropriate for colder weather. Although we'd advise wearing with a coat, unlike Kate. Keep scrolling to see Kate's latest look and shop similar ankle boots. Next up, see our guide to Kate Middleton's best looks.